One of the best and most amazing ways to experience beer as a dinner beverage is to attend a beer dinner, where the chef has teamed up with a brewmaster or a beer importer to develop and pair food and beer recipes that call for the perfect beer as either an ingredient or a beverage. If you’re even moderately intrigued by the concept, go for it. You’ll find it unlike anything you’ve ever experienced. To find one near you, start by checking out the local brewpub, gastropub, or beer bar. You can make the idea of a beer dinner work for you at home, too. The ideal beer dinner pairs a different beer with each course being served. Depending on how many courses you plan to serve, this may mean too few beers are tasted, which can lead to disappointment, or too many, which can lead to palate fatigue and intoxication. If you’re serving only three or four courses, you may want to consider offering a second beer choice for some or all the courses. If you’re serving seven or more courses, you may want to reduce the beer serving portion at each course to around 4 ounces. Serving more than eight different beers at a single beer dinner event is overkill (it’s supposed to be a repast, not a debauch). 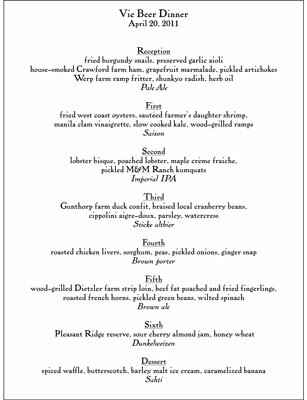 Check out the sample beer dinner menu. Ideally, you should be able to serve two to three people from a single 12-ounce bottle, which reduces both the cost and that bloated feeling.